These MTD Yard Machine lawn mowers are reasonably priced because what you are paying for is essentially just their Honda or Briggs & Stratton engines -- names that are traditionally widely trusted. There are not a lot of frills here. The only thing a bit out of the ordinary is the pair of 12-inch-high rear wheels. If your yard is plagued by hilly or uneven terrain or areas with tree roots protruding from the ground (a real hassle for mowing), using high wheels can be a great blessing. Once you try it, you may never go back to shorter wheels! 5-horsepower Briggs & Stratton engine. I am reviewing model 11A-508B752 of the MTD Yard Machine lawn mower here. The product now sold on Amazon is a different model, but it is very similar. The price is right for these MTD lawn mowers. 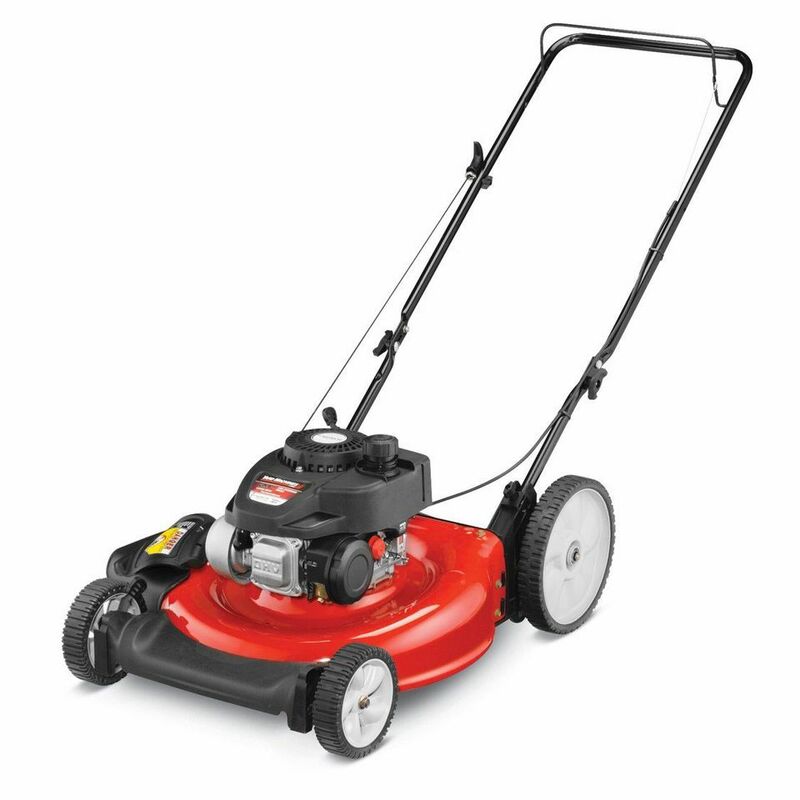 Their Briggs & Stratton engine has traditionally inspired confidence. Few "bells and whistles" on these MTD lawn mowers: this is just your basic grass-cutter. This review was originally written for Model 11A-508B752 MTD Yard Machine lawn mowers, which have a 5-horsepower, Briggs & Stratton engine and high wheels. But availability may be limited, so the Mtd 11A505A790 6.5 HP Pushmower could be a substitute. Since Briggs & Stratton engines have traditionally built a reputation for reliability, this feature alone is thought by some to be a selling point for Model 11A-508B752 MTD Yard Machine lawn mowers. These MTD Yard Machine lawn mowers are the "push" variety, making them suitable for small to medium-size yards. The Honda engine model (Model 12A-568Q701) is self-propelled and therefore preferable for large yards. The most prominent feature of these MTD Yard Machine lawn mowers is the 12"-high rear wheels, and that's what we're really focusing on in this review (more so than the engine). Many homeowners struggle with hard-to-mow yards for years, unaware of the existence of alternatives to the standard-size mowing wheel. For instance, some yards are marred by bumpy surfaces. Among the most challenging for mowing are those studded with exposed tree roots. But with adjustable high wheels, you can handle the job with ease. But the high rear wheels will come in most handy if you have a slope to mow since they make the equipment so much easier to push. Anyone who doubts this should arrange to test a high-wheel MTD Yard Machine lawn mower on a hill. The experience could be a real eye-opener!